There was a Hillary Clinton event at the Nashua airport this morning. 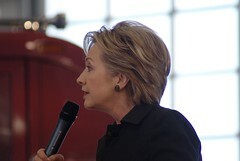 She hasn't changed her speech very much and took a bunch of questions from the crowd. Two reporters interviewed me mostly interested in knowing what I thought of the 3rd place finish in Iowa and if she should change her message.